By understanding how your body functions and balancing your running regime with strength training, you can avoid injuries as well maximise your running performance. 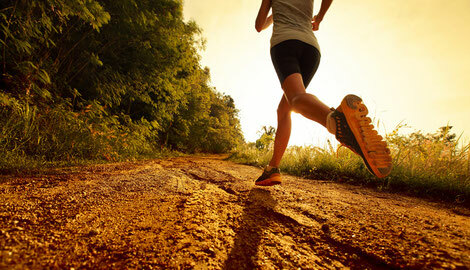 Running has become one of the most popular forms of exercise in Singapore and indeed worldwide. It’s cheap, accessible to anyone, requires minimal equipment, can be done alone, and in any environment. The number of races are growing and distances are getting longer with marathons, ultramarathons, ultratrails, or even Ironman triathlons gaining ground. The down side of this is that running places a high demand on the body with repetitive movements and long distances putting you at a higher risk for injury. Some of the most common injuries amongst runners that cause unnecessary pain and limit performance are knees or Achilles tendonitis, shin splints, plantar fasciitis, low back pain, IT band syndrome and hamstrings strains. The good thing however is, by understanding how your body functions and balancing your running regime with strength training, you can avoid injuries as well maximise your running performance. Whenever you practice a sport which comprises of repetitive movements, like running for example, there is a strong chance you will develop muscles imbalances. Simply put, a muscle imbalance appears when one muscle group (agonist) becomes stronger than its opposing muscle group (antagonist), creating permanent pressure on the joints, ligaments, and muscles themselves. Running relies mostly on the core and lower body and more specifically, on the quadriceps, hip flexors, as well as the gastrocnemius and soleus complex in the calves. An overuse of the quadriceps will create an imbalance with the hamstrings and glutes, these opposite muscle groups becoming long and weak. Both muscle groups having origins and insertions around the hip and knee joints, you can maybe already imagine the implications this will have for these joints. In addition to the quadriceps, the hip flexors and more precisely the iliopsoas muscle is likely to become stronger and shorter when running long distances. This muscle has its origin in the lumbar spine and has its insertion on the femur, the thighbone. Considering its position, it is thus easier to understand the negative impact this muscle has on the position of your hips and pelvis contributing to a postural imbalance. Muscle imbalances creating an anterior pelvic tilt. I should add here that there is another activity that contributes to a short iliopsoas: sitting, which comes down to staying in hip flexion for an extended amount of time. So, if you’re sitting at your desk for 8 hours, and then go for a run after work, then sit on your couch watching TV when you’re back home, well you’re more than likely to have a short iliopsoas. On top of all this, there is a major postural issue that plagues our society: a dysfunctional abdominal wall. Whether it is because of digestive problems, ab crunches or other poorly performed ab exercises, other postural issues, or even pregnancies, most people nowadays have a weak core. The most common dysfunction is an imbalance between the upper and lower abdominals. Most people have strong upper abdominals (the rectus abdominis or “six pack” that is the superficial layer of the abdominal wall), but a complete lack of strength and coordination in the lower abdominals (including the external obliques, the deep layer of the core, the transverse abdominis, that stabilises the pelvis and the lumbar spine). 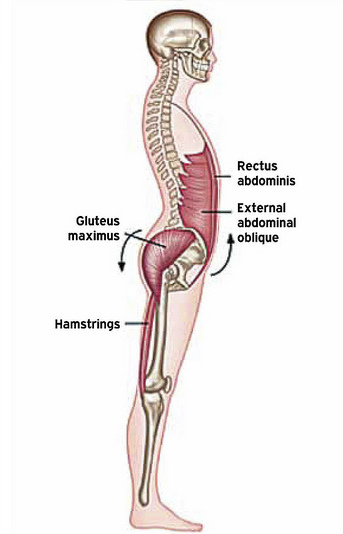 Now, if you have strong quadriceps and hip flexors pulling your pelvis forward, but weak hamstrings, glutes and lower abdominals, to proportionately balance this out, you will end up with what is called an anterior pelvic tilt (i.e. Donald Duck pose). This causes unstable hips, knees, and ankles and generally poor biomechanics. Add in the bouncing motion that takes place during running, leading to greater loading forces on these unstable joints and you have the perfect recipe for ligament, tendon or muscle injury. Now that’s for the lower body. But everything is connected in the body, so what’s happens in the upper body? As I said, most people have tight upper abdominals. This creates a depressed sternum and chest, an increase kyphosis or rounded upper back, which then pulls your shoulders and your head forward. In addition, if you work at a desk on a computer 8 hours per day, you reinforce that hunched back position, with not enough strength in the back to keep you upright. This could lead to back and neck pain, shoulder injuries or even frequent headaches. So now that we have a better understanding of the root causes of most injuries and pain, how do we fix it? We have muscles that have become so powerful that their strength outgrows weaker muscles around them. So we need to restore balance. What do we do when we have weak muscles? We strengthen them! Most people stretch their hamstrings whenever they have hamstrings injuries. But they end up loosening something that’s already loose, making hips and knees even more unstable! So your strength training program should focus on exercises targeting your weaker muscles: glutes, hamstrings, back muscles and lower abdominals. Deadlifts, bridges (both legs or single leg), box step ups with a kick, lat pulldowns or rows are great exercises to target these muscles. For your core, forget the crunch and the plank that will mostly activate your rectus abdominis or six pack. Supine marching, deadbugs or Pilates movements are a great start to regain coordination in your lower abdominals. That being said, since distance running is an endurance sport you want to focus on building muscular endurance, which is the ability for a muscle to sustain repeated contractions for an extended period of time. So instead of trying to deadlift the heaviest weight possible for one repetition, you should focus on higher rep ranges at lighter intensities, slower tempos, with shorter rest periods. The same is valid for exercises to correct posture in the upper body. 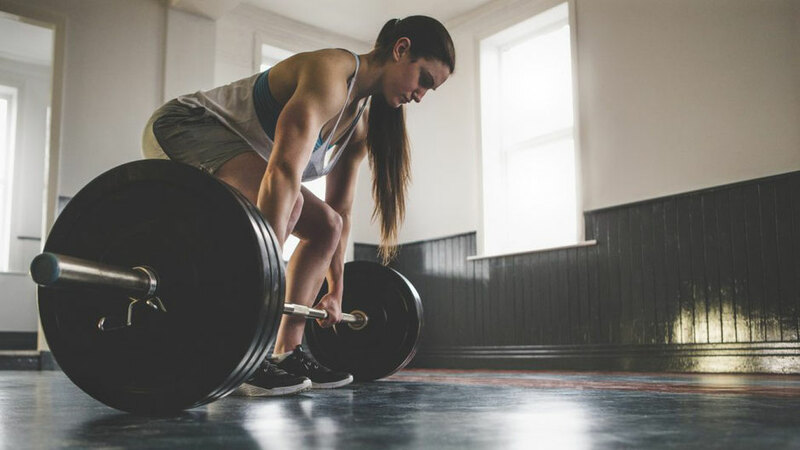 In general, runners have weak hips, glutes, and hamstrings which why it is important to deadlift - to strengthen those weak muscles. Now, when running, you not only need to be able to start the movement, but you also need to be able to slow down or stop the movement every time your foot lands on the ground. Just like in any car, you need a good engine, but also good brakes. That’s why eccentric training is a vital component of a balanced running program. Eccentric contraction of a muscle is the lengthening of a muscle while under load. An example would be the biceps muscle during a biceps curl. When extending your arm, your biceps contracts as it is lengthened. Eccentric training, that focuses only on these types of contractions, helps to improve the ability to decelerate limbs, control landings, and is extremely important to prevent injuries. For instance, a lot of hamstrings injuries could be avoided with eccentric training. Deadbugs are amazing for runners as they help strength the relationship between the core and lower body. First off, prevention is better than cure. Avoiding injuries is key to be able to keep training in the long-haul and overall increase performance. I don’t think I need to elaborate on this one. So train smarter, not harder. Now, remember that hunched back posture that we get when we have an imbalance between our trunk flexors (upper abs) and our extensors (back muscles)? Well this is basically a position of expiration. So you are now stuck in this position because of your muscle imbalances. Do you think we can properly breathe and inhale when we are stuck in a position of exhalation? Of course, not. This position disrupts the ability of the diaphragm to travel up and down in order to create the vacuum effect that pulls the air in and out of the lungs. You will end up with an abnormal breathing pattern, breathing mostly with your chest and neck, instead of what we call proper belly breathing. It is critical to note that a runner that cannot breathe properly is not going to run far or fast! Having a strong and powerful core will be the key to increased power and speed and optimal running performance. In addition to pain that may arise in your neck and trapezius muscles, not properly oxygenating your body, muscles and organs will have a detrimental affect on your health and well-being. Your deep core is like the foundation of your body, and a shaky foundation will not initiate any power. Your legs stem from your torso and your core, so the strength and power produced by your limbs are ultimately tied to the strength and power in your torso and core. As Paul Chek says, “You can’t fire a cannon from a canoe”. In order to have a proper running form and biomechanics, you need to be able to stabilise your pelvis and trunk during the push-off and landing phases. Therefore, a strong and powerful core will be the key to increased power and speed and optimal running performance. Finding a personal trainer in Singapore that has good knowledge in this area is not easy so feel free to check out our earlier guide on this for How to find the best personal trainers in Singapore. P.S. We understand that we have just presented a ton of information of which much may have been quite new to you. Sometimes it can all be a little be daunting knowing where to start. So, if you're looking for some support in creating a personalised and safe strength training programme that complements your running regime then, feel free to give us a buzz at 6285 0185, 9634 1940 or email us info@levitise.com.sg. Absolutely love this post. Injuries are an inseparable part of running. At some point or another, we run into some kind of minor or major injury while training. I'm so glad to have read this post. The images make it easier to understand the correct form of the exercise. Running may not be easy but I'm sure fixing the knee injury will be easier with these tips.